Here is a classic song performed by the glamorous Joi Lansing. Joi Lansing was the screen name of Joy Rae Brown (Salt Lake City, Utah, 1929 - Santa Monica, California, 1972) (she is sometimes also credited as Joyce Lansing, Joy Lansing, Joy Loveland). 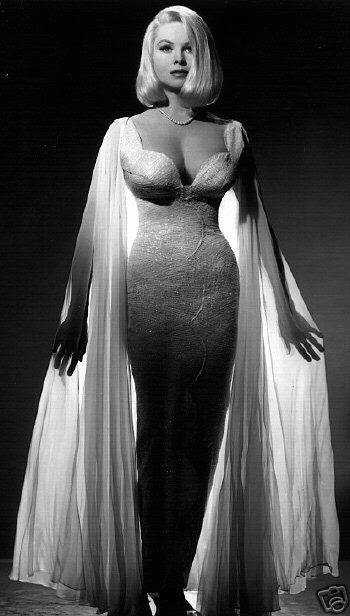 A statuesque blonde model and actress, Lansing was often cast in roles similar to those played by contemporaries Jayne Mansfield and Mamie Van Doren. Her earliest work was as a model (she was extremely successful throughout the 1940's), and she began her film career in 1948 (she appeared in "Easter Parade", with Judy Garland). In 1952, she played an uncredited role in the MGM blockbuster "Singin' in the Rain". In the opening scene of "Touch of Evil" (1958) by Orson Welles she appeared as Zita, a dancer who dies at the end of the famous first tracking shot. On television she appeared on "The Adventures of Wild Bill Hickok" (1951), "I Love Lucy" (1951), and "The Beverly Hillbillies" in a recurring role (1962-1968). In 1955 Joi landed a recurring role as Shirley Swanson in the TV series "The Bob Cummings Show". It was this show that proved to all that Joi could, indeed, act and act well. Because of this series, she began to get a few more substantial parts in films such as "The Brave One", "Hot Cars" and "So You Think the Grass Is Greener", all in 1956. Later movie roles included parts in "Marriage on the Rocks" (1965) and "Hillbillies in a Haunted House" (1967). In 1970 Joi shot her last two films, "Bigfoot" and "Superman" (1973). Sadly, because of her illness, she never saw them make the big screen. Lansing made more than 75 appearances in television and movies. A fine singer, she made in 1965 her first record album with songs written especially for her by composer Jimmie Haskell and actress Stella Stevens. She soon became a top nightclub act and did the New York hotel circuit singing at the America, Waldorf-Astoria, Hilton Hotel, the Living Room, the Persian Terrace of Hotel Syracuse. She also starred in short musical films for the Scopitone video-jukebox system. Some of these films, particularly "The Web of Love", have become classics. She died prematurely of cancer in Santa Monica, California, on August 7, 1972, aged only 43. Rediscover Joi's beauty and glamour and enjoy!